Welcome to lesson 1 of the ITIL Intermediate SOA tutorial, which is a part of the ITIL Intermediate SOA Foundation Certification course. This lesson provides the introduction to the core concepts and terminology of the service lifecycle stages that are related to SOA. These include select processes of service strategy and service design. Let us begin with Service Strategy and Strategy management for IT services process in the next section. You too can join the high earners’ club. Enroll in our ITIL Intermediate SOA Course here! The Service strategy provides guidance on how to design, develop, and implement service management not only as an organizational capability but also as a strategic asset. Guidance is provided on the principles underpinning the practice of service management that is useful for developing service management policies, guidelines, and processes across the ITIL Service Lifecycle. Service Strategy guidance is useful in the context of Service Design, Service Transition, Service Operation, and Continual Service Improvement. Strategy management for IT services is the process of defining and maintaining an organization’s perspective, position, plans and patterns about its services and the management of those services. Establish the criteria and mechanisms to decide which services will be best suited to meet the business outcomes and the most effective and efficient way to manage these services. Ensure that the strategy is defined, maintained and achieves its purpose. Analyse the internal and external environments in which the service provider exists, to identify opportunities that will benefit the organization. Identify constraints that might prevent the achievement of business outcomes, the delivery of services or the management of services; and define how those constraints could be removed or their effects reduced. Agree the service provider’s perspective and regularly review to ensure continued relevance. This will result in a clear statement of the vision and mission of the service provider. Establish the position of the service provider relative to its customers and other service providers. This includes defining which services will be delivered to which market spaces, and how to maintain a competitive advantage. Produce and maintain strategy planning documents and ensure that all relevant stakeholders have updated copies of the appropriate documents. This will include the IT strategy, the service management strategy and the strategic plans for each service where appropriate. Ensure that strategic plans have been translated into tactical and operational plans for each organizational unit that is expected to deliver on the strategy. Manage changes to the strategies and related documents, ensuring that strategies keep pace with changes to the internal and external environments. Let us look into the scope of Strategy Management in the next section. Strategy management is the responsibility of the executives of an organization. It enables them to set the objectives of the organization, to specify how the organization will meet those objectives and to prioritize investments required to meet them. However, in medium to large organizations, it is unlikely that the executives themselves will conduct the assessments, draft the strategy documents and manage the execution. This is normally performed by a dedicated strategy and planning manager reporting directly into the board of directors. An organization’s strategy is not limited to a single document or department. The overall strategy of an organization will be broken down into a strategy for each unit of the business. There are likely to be several strategies within each organization. Strategy management for the enterprise has to ensure that these are all linked and consistent with one another. Strategy management for IT services has to ensure that the services and the way they are managed support the overall strategy of the enterprise. Strategy management is described above as a generic process that could be applied to the business as a whole, or to any of the business units. However, this publication is specifically concerned with how this process is applied to IT as a service provider. Please note that in an external service provider, the business strategy might be related to IT services delivered to an external customer, and the IT strategy would be related to how those services will be delivered and supported. At the same time, external service providers do not just provide IT services to customers. They are also consumers of their own (and potentially other third-party) IT services. External service providers also have internal IT service requirements that must be met to enable them to survive. Now, we will understand the value of Strategy Management. The strategy of an organization articulates its objectives, and defines how it will meet those objectives and how it will know it has met those objectives. Without a strategy, the organization will only be able to react to demands placed by various stakeholders, with little ability to assess each demand and how it will impact the organization. In these cases, the actions of the organizations tend to be led by whoever is making the loudest demands, rather than by what is best for the organization. Strategy becomes a function of organizational politics and self-interest, rather than the overall achievement of its objectives. A well-defined and managed strategy ensures that the resources and capabilities of the organization are aligned to achieving its business outcomes, and that investments match the organization’s intended development and growth. Strategy management ensures that all stakeholders are represented in deciding the appropriate direction for the organization and that they all agree on its objectives and the means whereby resources, capabilities, and investment are prioritized. Strategy management also ensures that the resources, capabilities, and investments are appropriately managed to achieve the strategy. For a service provider, strategy management for IT services ensures that it has the appropriate set of services in its service portfolio, that all of its services have a clear purpose, and that everyone in the service provider organization knows their role in achieving that purpose. Shifting investment priorities. The service provider will be able to de-focus attention from one service, and re-focus on another, ensuring that its efforts and budget are spent on the areas with the highest level of business impact. For the customer of the service provider, strategy management for IT services enables them to articulate clearly their business priorities in a way that is understandable to the service provider. The service provider is then able to make a decision about how to respond to the customer. In some cases, the customer demand represents a departure from the service provider’s strategy. The service provider will use strategy management for IT services to make a decision about whether to change its strategy, or whether to turn down the business. Where the service provider is an internal IT organization, the second option is not always possible, and in these cases, it will use strategy management for IT services to work with the business units to make them aware of the impact of their demand on the current strategy. The business executives will be able to work with IT either to change the existing strategy or to decline the opportunity. In other cases, customer demands do not change the service provider’s strategy but will require it to change its priorities. Strategy management for IT services enables the service provider to determine the best way to change its priorities and balance its resources, capabilities, and investments. Let us start with Service Design and Design Coordination Process in the next section. Now let us get an insight of Design Coordination process. In the next section, we will discuss what does the Service Design provides us and what are the scopes of Service Design. The Service Design volume guides the design and development of services and service management processes. It covers design principles and methods for converting strategic objectives into portfolios of services and service assets. The scope of Service Design is not limited to new services. It includes the changes and improvements necessary to increase or maintain value to customers over the lifecycle of services, the continuity of services, achievement of service levels, and conformance to standards and regulations. Let us now learn about the purpose and objectives of Design Coordination process. The service design stage of the lifecycle is responsible for the design of new or changed services for introduction into the live environment. It is essential to ensure that the design activities are driven principally by the business needs and requirements of the organization. Service design considers all aspects and adopts a holistic approach to designing the services. The activities involved are elaborate and complex. To ensure the development of comprehensive and appropriate designs the various activities involved need to be managed and coordinated well. This is where Design Co-ordination process plays an important role. to ensure that the goals and objectives of the service design stage are met by providing and maintaining a single point of coordination and control for all activities and processes within this stage of the service lifecycle. Monitor and improve the performance of the service design lifecycle stage. In the next section, we will understand the scope of Design Co-ordination. The scope of the design coordination process includes all design activity, particularly all new or changed service solutions that are being designed for transition into (or out of, in the case of a service retirement) the live environment. Some design efforts will be part of a project, whereas others will be managed through the change process alone without a formally defined project. Some design efforts will be extensive and complex while others will be simple and swift. Not every design activity requires the same level of rigor to ensure success, so a significant number of design efforts will require little or no individual attention from the design coordination process. Most design coordination process activity focuses on those design efforts that are part of a project, as well as those that are associated with changes of defined types. Typically, the changes that require the most attention from design coordination are major changes, but any change that an organization believes could benefit from design coordination may be included. Each organization should define the criteria that will be used to determine the level of rigor or attention to be applied in design coordination for each design. Some organizations take the perspective that all changes, regardless of how small in scope, have a ‘design’ stage, as it is important that all changes have clear and correct plans for how to implement them. In this perspective, the lifecycle stage of service design still occurs, even if the designs for simple or standard changes are usually pre-built and are reused frequently and quickly. Sometimes the stage is quite complex and long and sometimes it is simply a rapid check that the right ‘design’ (procedure) is being used. Other organizations take the perspective that only change that fit certain criteria, such as those associated with a project or major change, have a formal service design stage. In this perspective, changes that fail to meet the agreed criteria may be considered out of the scope of this process. Whichever perspective is adopted by an organization, the end result should be more successful changes that deliver the required business outcomes with minimal disruption or other negative impacts on business operations. If an organization’s approach produces that result, then the organization is performing design coordination correctly. Ensuring the production of service designs and/ or SDPs and their handover to service transition. Responsibility for designing the detailed service solutions themselves or the production of the individual parts of the SDPs. These are the responsibilities of the individual projects or service management processes. We will look into the value of the design coordination process in the next section. Service Management processes must be designed, implemented and managed in a way that they deliver the desired benefits to Business. The Design Co-ordination process also focuses in the same direction and delivers some benefits. The key value of this process is the production of consistently good quality solution designs and service design packages that will provide the desired business outcomes. Achieving greater agility and better quality in the design of service solutions, within projects and major changes. In the next section, we will discuss the value of service. Planning for a career in ITIL Intermediate SOA? Click to get complete Course details here! Services are a means of delivering value to customers by facilitating outcomes customers want to achieve without the ownership of specific costs and risks. Outcomes are possible from the performance of tasks and are limited by the presence of certain constraints. Services facilitate outcomes by enhancing the performance and by reducing the grip of constraints. The result is an increase in the possibility of desired outcomes. While some services enhance the performance of tasks, others have a more direct impact. They perform the task itself. Value is often measured by how much the customer is willing to pay for the service, rather than the cost of the service or any other intrinsic attribute of the service itself. This indicates that the value of a service is determined by the person who receives or uses the service rather than the provider of the service. Value is defined by customers – It is the customers who will decide what they will do with the service, what return and objectives they will achieve by utilizing the service. Thus the ultimate decision as to whether a service is valuable or not rests with the customers. Value is an affordable mix of features - Customers normally select the service that has the best mix of features, meeting their requirements, at the price they are willing to pay. Achievement of objectives - While some commercial organizations focus on achieving financial objectives, non-commercial or government organizations focuses on other objectives. From this perspective, the value of service is determined by measuring how far the service supports achievement of stated objectives. Value changes over time and circumstances - With changing business needs, objectives, and environmental factors, a service that is valuable today may not be valuable at a later point in time. The value of a service can be considered to be the level to which that service meets a customer’s expectations. It is often measured by how much the customer is willing to pay for the service, rather than the cost of the service or any other intrinsic attribute of the service itself. Unlike products, services do not have much intrinsic value. The value of a service comes from what it enables someone to do. Value is defined by customers: No matter how much the service provider advertises the worth of their services, the ultimate decision about whether that service is valuable or not rests with the customer. An affordable mix of features: it is possible to influence the customer’s perception of value through communication and negotiation, but that still does not change the fact that the customer will still make the final choice about what is valuable to them. A good salesperson can convince a customer to change the priorities influencing their purchase, but the customer will select the service or product that represents the best mix of features at the price they are willing to pay. Achievement of objectives: Customers do not always measure value in financial terms, even though they may indicate how much they are prepared to pay for a service that helps them to realize the desired outcome. For example, the police might focus on reduction in crime or the apprehension of criminals; social welfare departments might focus on the amount of funding disbursed to needy families; a mountain rescue organization might focus on the number of people warned about, or rescued from, avalanches. Value changes over time and circumstances: What is valuable to a customer today might not be valuable in two years. For example, retail outlets might focus on selling a higher percentage of luxury goods when the economy is good, but during a recession, they shift the focus to budget product lines and fewer luxury goods. What service(s) did IT provide? If IT is only perceived as managing a set of servers, networks and PCs, it will be very difficult for the customer to understand how these contributed to the value. Now let’s understand value from the customer’s perception in the next section. Perceptions of value are influenced by expectations. Customers have reference values on which they base their perceptions of added value from a service. The reference value may be vaguely defined or based on hard facts. An example of the reference value is the baseline that customers maintain on the cost of in-house functions or services. What matters is that it is important for the service provider to understand and get a sense of what this reference value is. This may be obtained through extensive dialogue with the customer, prior experience with the same or a similar customer, or through research and analysis available in the market. The economic value of the service is the sum of this reference value and the net difference in value the customer associates with the offered service. Positive difference comes from the utility and warranty of the service. Negative difference comes from losses suffered by the customer from utilizing the service due to poor quality or hidden costs. In the next section, let us discuss Utility and Warranty of service. From a customer’s perspective, the value of a service is directly related to the extent to which it supports achieving business objectives. However, two primary elements represent the value of a service. Let us now discuss these two elements. It should be noted that these elements are not mutually exclusive. A service can create value, only when it is fit for purpose as well as fit for use. It is therefore important that both utility and warranty should be designed and delivered together. Failure to do so often results in a limited ability to deliver the utility, and attempts to design warranty after a service has been deployed can be expensive and disruptive. In the next section, let us discuss Marketing Mindset. Service providers differentiate themselves from equipment vendors purely through added value even while using the equipment from those same vendors as assets. Differentiation can arise from the provision of communication services instead of routers and switchboards. Further differentiation may be gained from the provision of collaboration services instead of simply operating email and voicemail services. The focus shifts from attributes to the fulfillment of outcomes. With a marketing mindset, it is possible to understand the components of value from the customer’s perspective. As described earlier, value consists of two components: utility or fitness for purpose and warranty or fitness for use. Let us move to the next section, where we will learn to Identifying and understanding customer requirements. The accurate identification, documentation, and agreement of customer and business requirements are fundamental to the production of good service solution designs. 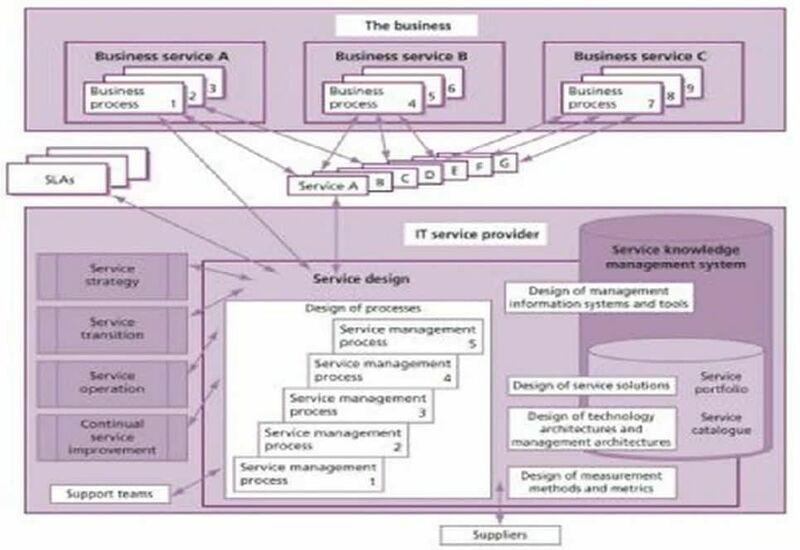 ITIL Service Design enforces the principle that the initial service design should be driven by some factors, including the functional requirements, the requirements within service level agreements (SLAs), the business benefits, and the overall design constraints. Service design stage of the lifecycle adopts a holistic approach to designing a new, changed or retiring service. There are five aspects of Service Design which are considered, and we shall now be taking a brief view of these five aspects. The requirements for the new or changed services are taken from the service portfolio. Each of these requirements is analyzed, documented and solution design is produced. It is ensured that the design is consistent with other services and that all other services that interface with, underpin or depend on the new or changed service are consistent with the new service. The management information systems and tools are reviewed to ensure that they are capable of supporting the new or changed service. In case any new systems and tools have required the designs for the same will be created. These are reviewed to ensure that all the technology architectures and management architectures are consistent with the new or changed service and have the capability to operate and maintain the new service. If required these are amended or new designs created. All IT and service management processes are reviewed to ensure that these processes, related roles and responsibilities and skills have the capability to operate, support and maintain the new or changed services. Updates and adjustments to the design are made where required. The existing measurement methods are reviewed to ensure that they can provide the required metrics on the new or changed service. If required, new metrics are designed, and updates to existing ones are made. In the next section, we will discuss how to identify service requirements. Service Design must consider all elements of the service by taking a holistic approach to the design of a new service. No service can be designed, transitioned and operated in isolation. The relationship of each service to its supporting components and services must be clearly understood and recognized by all people within the service provider organization. It is also essential that all targets contained within supporting agreements, such as OLAs and contracts, underpin those agreed between the service provider and its customers. Some of these concepts are discussed in more detail in later sections of the publication, concerning the individual aspects of Service Design. However, when an individual aspect of a service is changed, all other areas of the service should also be considered to ensure that any amendments necessary to support the change are included in the overall design. Increasingly, services are complex and are delivered by some partner or supplier organizations. Infrastructure: the management and control of all infrastructure elements, including mainframes, servers, network equipment, database systems, storage area networks (SANs), network-attached storage (NAS), systems software, utilities, backup systems, firewalls, development and test environments, management tools, etc. Environmental: the management and control of all environmental aspects of all major equipment rooms, including the physical space and layout, power, air conditioning, cabling, physical security, etc. Applications: the management and control of all applications software, including both bought-in applications and in-house developed applications software. Now, we will understand how to Identifying customer requirements. IT must retain accurate information on business requirements and drivers if it is to provide the most appropriate catalog of services with an acceptable level of service quality that is aligned to business needs. Business drivers are the people, information, and tasks that support the fulfillment of business objectives. This requires that IT develops and maintains close, regular and appropriate relationships and exchange of information to understand the operational, tactical and strategic requirements of the business. This information needs to be obtained and agreed in two main areas to maintain service alignment. Let us discuss the Information on the requirements for new services. Level of business capability or support to be provided. e.g. local business-based support. This collection of information is the first and most important stage for designing and delivering new services or major changes to existing services. The need for accurate and representative information from the business is paramount. This must be agreed and signed off with senior representatives within the business. If the incorrect or misleading information is obtained and used at this stage, then all subsequent stages will be delivering services that do not match the needs of the business. Also, there must be some formal process for the agreement and acceptance of changes to the business requirements, as these will often change and evolve during the Service Lifecycle. The requirements and the design must evolve with the changing business environment to ensure that the business expectations are met. However, this must be a carefully managed process to ensure that the rate of change is kept at an agreed and manageable level, and does not ‘swamp’ and excessively delay the project or its implementation. The strength and significance of ITIL framework lie in the fact that it gives as much importance to the retirement of services as to that of new or changed services. The business information that needs to be obtained and agreed includes information on the requirements for retiring services. Archiving strategy for any business data and any potential access requirements for archived data related to the retiring service. Let’s understand ROI in the next few sections. 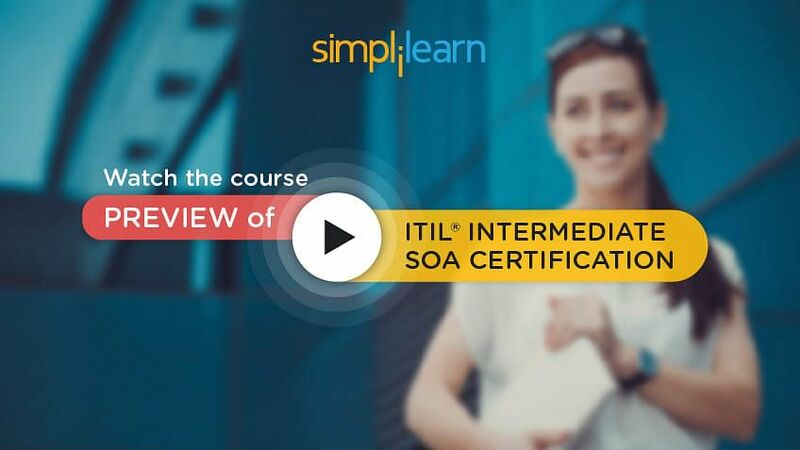 You should also consider taking an ITIL Intermediate SOA Course now! Return on investment (ROI) is a concept for quantifying the value of an investment, and the calculation is normally performed by financial management. The term is not always used consistently. Sometimes it is used by financial officers to indicate the ROIC (return on invested capital), a measure of business performance. In service management, ROI is used as a measure of the ability to use assets to generate additional value. In the simplest sense, it is the net profit of an investment divided by the net worth of the assets invested. The resulting percentage is applied to either additional top-line revenue or the elimination of bottom-line cost. In economic terms, a good investment is one that exceeds the rate of return on the capital market. ROI = Increase in profit resulting from the service divided by Total investment in the service. Although this calculation seems to be straightforward, it is somewhat simplistic since customer perception is subjective, and there are many intangible factors involved in delivering the services. It is even more difficult to quantify the value of service management – since it is not delivered directly to a customer, and does not directly deliver business outcomes for the customer. Let us discuss the areas where ROI focuses. While service can be directly linked and justified through specific business imperatives, few companies can readily identify the financial return for the specific aspects of service management. It is often an investment that companies must make in advance of any return. Service management by itself does not provide any of the tactical benefits that business managers typically budget for. One of the greatest challenges for those seeking funding for ITIL projects is identifying a specific business imperative that depends on service management. Post-programme ROI: Techniques for retroactively analyzing an investment in service management. Now, we will learn what a business case is and the structure of a business case. A business case is a decision support and planning tool that projects the likely consequences of business action. The consequences can take on qualitative and quantitative dimensions. A financial analysis, for example, is frequently central to a good business case. The structure of a business case varies from organization to organization. A generic form is provided below. Risks and contingencies - Probability that alternative results will emerge. Recommendations - Specific actions recommended. What they all have in common is a detailed analysis of business impact or benefits. Let us also discuss the Business Objective. The structure of a business case varies from organization to organization. What they all have in common is a detailed analysis of business impact or benefits. Business impact is in turn linked to business objectives. A business objective is a reason for considering a service management initiative in the first place. The business objectives for commercial provider organizations are usually the objectives of the business itself, including financial and organizational performance. The business objectives of an internal service provider should be linked to the business objectives of the business unit to which the service is being provided and the overall corporate objectives. The business objectives for not-for-profit organizations are usually the objectives for the constituents, population or membership served as well as financial and organizational performance. Also, a business case should not focus on financial analysis only and neglect non financial impacts. Multiple business impacts can affect a single business objective. Let understand the single business impact and multiple business impacts in the next two sections. We will now look at a couple of examples that illustrate the relationship between business impacts and business objectives. 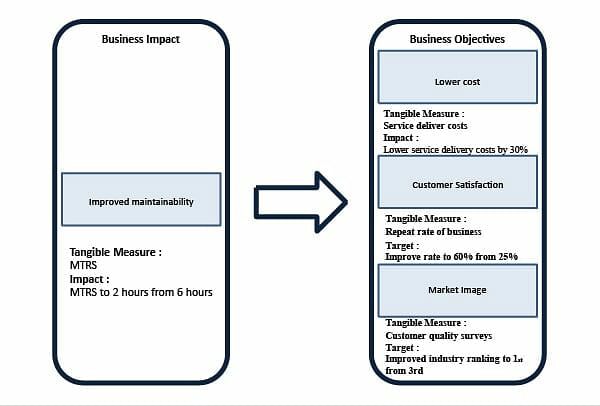 The diagram shown below represents how a Single Business Impact might result in achieving Multiple Business Objectives. The business impact of improved maintainability could result in reduced costs, as the service requires less staff time to resolve incidents, which in turn results in a lower investment in the service from the business, and increased profitability. At the same time, customer satisfaction is increased because the business is able to improve its quality of delivery, which in turn results in an increase in the percentage of customers that return to the organization for repeat business. The market image of the organization is improved, since service quality results in higher customer satisfaction and company performance, which in turn results in an improved ranking in industry survey results. It is also possible that a number of business impacts might relate to one business objective. The diagram shown below represents this scenario. The positive business impacts of: improved reliability by improving the mean time between failures, improved maintainability by improving the mean time to restore service, and improved service performance by enabling 24 by 7 placement of products online are directed to achieving the sole objective of enhancing customer satisfaction. This improved customer satisfaction is measured by the percentage increase in repeat business from customers. The next lesson talks about Service Portfolio Management.